Location: Western West Virginia, U.S.A.
Pursuing a long-time interest, I started backpacking 3 years ago, beginning with day-hiking and single overnights. Currently I’m mostly a ‘weekend warrior’, but managed a week long section of the Appalachian Trail (AT) last year. I hike and backpack mainly in the hills and valleys of West Virginia, but will be section hiking more of the AT this year. I’m usually a hammock sleeper, but will soon be testing a Tarptent. In general my backpacking style is lightweight and minimalist, and I try to cut as muck pack weight as I can without sacrificing warmth, comfort, or safety. The Hyper High Mtn is one of P.O.E. 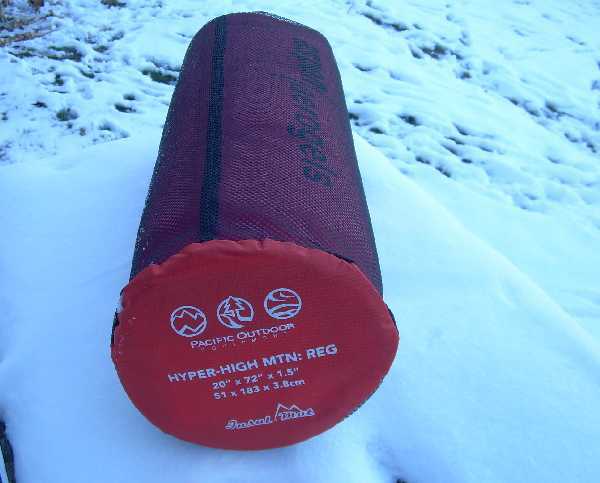 's HYPER-LITE series sleeping pads, intended for cold weather use, and described as a 'four season' pad. Standard features for this pad include anti-fungal treatment; DWR (durable water repellent) finish; and a hard annondized aluminum valve, according to the manufacturer's website. Unlike many other sleeping pads that are constructed of only one or two types of material (i.e. closed cell foam or open cell foam encased in a shell fabric), the Hyper High Mtn is constructed of several types material. The bottom of the pad consists of a .25 in (.64 cm) thick layer of red EVA foam. The top of the pad has a charcoal colored layer of PE foam of the same thickness, with an orangish red self-inflating style insert in the torso to hip area. The PE foam is cored with a diamond pattern at the top and in the leg area of the pad. The truly unique material in this pad is Aspen Aerogel, which is sandwiched between the layers, and which is purported to provide maximum insulation for minimum weight. Although it can't be seen, I can tell where it is, because I hear a slight 'crunchy' sound in the areas where the Aspen Aerogel is located when I flex the pad material. The pad is slightly different than what I expected from viewing it on the manufacturer website, mainly because the diamond shaped coring and the bottom of the pad being a different color aren't visible from the website photo, and the actual pad is slightly different in color shade than I expected. The overall shape of the pad and the insert are consistent with the website photo. The top of the pad measures 9 in (23 cm) across, tapering down to its full width of 20 in (51 cm) about 11 in (28 cm) down from the top edge. It remains at the full 20 in (51 cm) width for about 30 in (76 cm), at which point it begins gradually tapering to 12 in (30.5 cm) wide at the foot end. 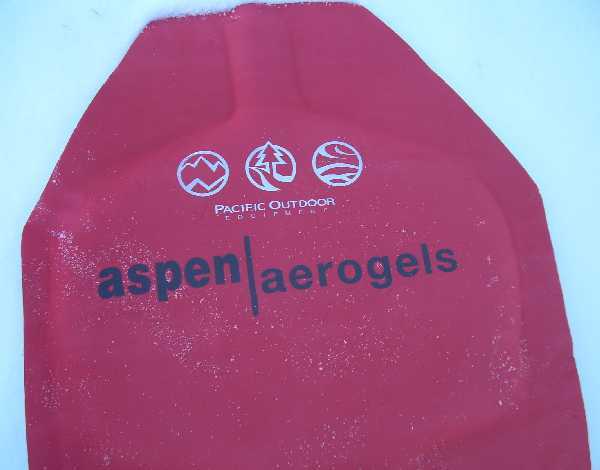 The manufacturer name and logo and the words "aspen/aerogels" are printed on the self-inflating section of the pad on the front and in the corresponding area on the back of the pad. The mesh storage bag provided has a nylon bottom with a small pocket on the inside containing a repair kit (for the self-inflating portion of the pad) in a small zip-lock bag. The repair kit consists of two fabric swatches (red and black), a small tube of adhesive, and repair instructions. No care instructions or warranty information was provided with the pad, but these are available on the manufacturer website as of the time of this report. The care instructions are fairly simple - make sure the pad is dry before storing and avoid storing in damp areas to prevent mildew, clean with mild soap and warm water with the pad valve closed and air dry, keep the mat away from flames or sparks, avoid using it on sharp or abrasive surfaces, keep it out of swimming pools, and avoid using a pump and overinflating it. The pad has a lifetime warranty against defects in materials and workmanship. Overall the pad appears to be well constructed. The materials are smoothly cut, no glue or other laminating material shows anywhere, and the fabric covering the self-inflating section appears flawless.The inflating valve opens and closes smoothly. It only takes about two long breaths to fully fill the pad with air. The self-inflating portions of the pad are well positioned beneath my shoulders and hips when I lay on the pad, and in early 'in-home' tests it seems cushy enough to be comfortable whether lying on my side, stomach, or back. The pad is long enough that I can fully stretch out on it, including extending my toes, without any part of my body hanging over the edges. The pad is easy to roll up and slide back into the provided mesh storage bag. When it arrived, the self-inflating portion was rolled to the inside of the pad, but this results in the pad curling up at the ends when unrolled. I plan to try storing and packing it with the EVA side rolled to the inside to see if the pad will lay flatter when I unroll it in my hammock or tent. The one downside that I've noticed so far is that the pad readily picks up, and hangs onto pet hair, especially on the EVA foam side. Pet hair isn't a big problem when I'm camping, but this makes me wonder if leaf litter and other natural debris will stick to it. The pet hair was easily removed with an adhesive type lint roller, but I don't normally carry one of those along on backpacking trips, so I wonder how difficult it will be to keep the pad clean on trips. Of special concern to me is that I don't end up carrying seeds of an invasive type plant from one area to another, so I typically try to make sure my equipment is as clean as possible before I pack it up. The EVA foam side also tends to hold imprints, as evidenced by the dents from the self-inflating portions of the pad and the die-cut sections. These correspond to the way the pad was rolled. Hopefully this won't result in the pad compressing excessively, and thus losing warmth over the course of the test. I'm primarily a side/stomach sleeper, although I tend to toss from side to side, and I like to sleep warmly. While I don't consider myself a particularly cold sleeper, I always like to make sure I bring adequate insulation to keep me warm, even if that means toting extra weight. Of special interest to me are how easy it is to remain on this pad through the night, and whether the unique construction of this pad will result in warmer sleeping conditions while still keeping my pack fairly light. I'll be summarizing these findings after field testing of the pad. In February I used the Hyper High Mtn in my Hennessy Hammock on an overnight backpacking trip in western West Virginia. The overnight low temperature was around 35 F (2 C), and it was breezy, and with blowing rain for at least an hour. I used a thin closed cell foam pad folded in half and placed on my right side to supplement the Hyper High Mtn to add insulation on the side, necessary due to the way a hammock wraps around the sleeper. I also used the Hyper High Mtn in March at Girl Scout camp, sleeping under the stars using a plastic drop cloth underneath. Temperatures were around 35 F (2 C) with only a very slight occasional breeze and no precipitation. In April I used the Hyper High Mtn on an overnight backpacking trip on the Appalachian Trail (AT) in Tennessee, in Curley Maple Gap Shelter. For those who may not be familiar with AT shelters, they vary somewhat in construction, but usually have a roof, floor, and three sides, with the front being open. Curley Maple Shelter has a plywood floor, concrete block walls, a metal roof, and a covered 'porch' area created by the roof extending in front of the shelter. Temperatures dropped to around 20 F (-7 C) during the night, with light breezes. Also in April, I used the pad in the Tarptent Double Rainbow on an overnight backpacking trip in southern West Virginia, where the overnight low was 35 F (2 C), with no precipitation, but high humidity. The Hyper High Mtn has been comfortable and warm in all circumstances so far. It was fairly easy to position inside my hammock and stayed in place better than other closed cell foam pads I've used in the past. I also found it easy to remain on the pad during the night, and it provided good, warm insulation. I was very pleasantly surprised to find it was quite comfortable when sleeping on the ground and the plywood floor of the Appalachian Trail shelter. The inflating portion of the pad provided enough cushion that I felt comfortable through eight hours of sleep, turning only occasionally. I did find the pad shifted a little during the night on the silnylon floor of the Tarptent, which was not unexpected. Even in 20 F (-7 C) temperatures, I can feel heat radiating back to my body from the pad, making for a pleasantly warm sleep when combined with a warm sleeping bag. I've found it has worked best to roll the pad with the self inflating portion to the outside when storing it in the mesh bag, which keeps it from curling up when I unroll it. The self inflating portion takes only a few puffs of air to fill, then I twist the valve shut and the pad is ready to sleep on. The pad deflates easily by twisting the valve open and rolling it up from the foot end, pushing the air out as I roll the pad up. Closing the valve again makes it easier to fit the deflated pad into the mesh storage bag. Although the rolled pad is bulky, I've found I can fit it inside of both my Granite Gear Stratus Latitude pack and my Go-Lite Quest, and still have room for my sleeping bag, warm clothing, food, and other essentials for a weekend backpacking trip. In the Quest, I've found it works best not to store the pad inside the mesh bag, but to roll it loosely with the EVA foam side to the outside, place it in the pack, and push the pad against the perimeter of the pack walls. I can then store my other gear inside the pad, which seems to work better than trying to stuff it along side the pad if it is tightly rolled together. Items with sharp edges will leave impressions on the pad, which remain for a long time, but sometimes eventually disappear. The pad has also developed a few gouges on the EVA side. While I don't remember any especially rough encounters with anything, these types of gouges have occured with other closed foam pads I've used in the past, which are usually caused from normal encounters with small twigs, pebbles, or other debris that ends up on sleeping surfaces, or during trail encounters with stray limbs or other brush when I pack a pad on the outside of my pack. These don't appear to affect the insulating ability of the pad in any way, and I chalk them up to 'normal wear and tear'. So far I'm very pleased with the P.O.E. Hyper High Mtn sleeping pad. It has provided adequate warmth on its own down to 20 F (-7 C). It does show a few gouges and scratches on the EVA foam side, but so far, no more than other foam pads I've used. The pad has good 'grip' on the surfaces I've tested it on so far, except the silnylon floor of the Tarptent, staying put on plywood, plastic, and in my nylon hammock. This concludes my Field Report. In early May I used the P.O.E. Hyper High Mtn for two nights at Girl Scout Camp, the first camping in a field near one of gravel access roads, and the second on a short overnight backpacking trip. The first evening temperatures were around 60 F (16 C) overnight with some light breeze, with a high around 75 F (25 C) the next day. The elevation was around 700 ft (200 m), and the ground was fairly level, with somewhat compacted ground covered in short grass. The second night the overnight temperatures were in the low 40 F (4 C) range, with steady moderate rain in the evening through the middle of the night, with little to no wind. The elevation around 900 ft (300 m), and the ground was slightly sloped, loamy, with light duff on top. My shelter was a Tarptent Double Rainbow, and I slept in a Sierra Designs Mist 0F/-18C sleeping bag. In late May, I used the Hyper High Mtn on a 28 mi (45 km), three day backpacking trip to the Cranberry Wilderness and Backcountry in southeastern West Virginia. Temperatures ranged from overnight lows of 50 F (10 C) to highs about 75 F (25 C). Elevations varied from around 2800 to 4200 ft (850 to 1300 m). Skies were clear to partly cloudy, with only a few scattered rain drops one evening, but high humidity during the entire trip. I again used the Tarptent Double Rainbow as my shelter, but this time I used a Jack's-R-Better Nest Down Under converted to a top quilt for upper insulation. In early June, I used the Hyper High Mtn two nights at Girl Scout camp in northern West Virginia. Temperatures were in the mid 40 F (7 C) range the first night, with moderate to heavy rain, and in the 50 F (10 C) range the second night with clear skies. Elevation was around 1000 ft (300 m). Due to having a lot of first time campers who have a hard time adjusting to night noises at camp, and not a lot of set up time, I slept in a platform tent on a cot with a 4 in (10 cm) thick foam mattress, using the Hyper High Mtn on top mainly as a cleaner surface than the cot mattresses which sometimes have some spots of mildew, and usually are very hot and sticky if a sheet, sleeping bag, or other surface isn't used between the sleeper and the mattress. I used a customized Nunatak ghost quilt for upper insulation. For the early May trips at Girl Scout camp, I packed the P.O.E. Hyper High Mtn inside a GoLite Quest pack with the EVA side next to the pack sides, leaving the center of the pack open for my other gear. The pad fits inside okay, but doesn't leave a lot of room to pack other items. Fortunately, these days I pack pretty lightly, so this works out all right. When I unrolled the pad, I found the head and foot area wanted to curl up slightly, but the weight of the sleeping bag was sufficient to hold the curled edges down. I experienced some light condensation overnight on the tent both evenings, but no condensation built up on the pad. The first night at camp the ground was pretty level, and I did not use the pad locks on the Sierra Designs Mist bag. I found I slid off the pad a few times during the night, but the temperatures were warm enough that this didn't chill me. In fact, using the 0 F/-18 C rated Mist, I appreciated the opportunity to cool off a little, as the bag was too warm. I didn't really feel the pad was too warm though, as I never felt overly hot underneath, just on top. The pad felt comfortable most of the night, but around 5 am I began feeling the need to shift positions fairly often to stay comfortable. The second night, on the short backpacking trip, the ground was more sloped, and using the pad on the slippery silnylon floor of the Tarptent Double Rainbow, I found the pad kept sliding down to the lower mesh wall. I found placing some wet clothing under the pad edge on the low side helped keep the pad from sliding as rapidly, but it still worked it's way down the slope gradually during the night. In spite of the wet conditions, I stayed warm and dry all night on the pad, with no noticeable condensation. On the softer surface of loamy soil, I didn't feel the need to turn as frequently as the night before to stay comfortable. For the trip in late May, I also carried the pad unrolled inside the GoLite Quest pack with gear packed in the center. I had painted some spots of seam sealer on the floor of the Double Rainbow, and I found this helped the pad stay in place very well. My tent site was fairly level, and I found the pad didn't move at all unless I moved it. I slept in a pair of light silk weight synthetic long john bottoms, a light wool T-shirt and a light long sleeved wool top each night, under a down quilt. There was light condensation on the top of the Tarptent, but no noticeable condensation on the pad. For some reason, perhaps being tired from little sleep the night before, or perhaps from not eating enough calories that day, I felt a slight chill in my legs the first night, and added a second long sleeved wool top. While I'm normally a side sleeper, I found that if I laid on my stomach as flat as I could against the pad, I could feel heat radiating back to me and this kept me warmer. Even though temperatures were about the same both nights, I slept warmly the second night without adding the second wool shirt or needing to press myself more firmly against the pad for extra warmth. During the weekend at Girl Scout camp in late May, I used the mesh storage bag to carry the pad loosely in the back of my Jeep, and just carried the mesh bag, a stuff sack with my quilt, and a duffel bag of clothing and miscellaneous items a few yards from my vehicle to the platform tent. The pad was naturally comfortable laying on top of the foam cot mattresses. One concern I had was that the pad might slip around on the vinlyl mattress covers, but this proved to be an unfounded worry, as it stayed in place all night. I slept in a synthetic T-shirt and shorts each night. Again, the first night I felt a little chilled in my legs, using a Nunatak Ghost quilt that was custom built with an ounce less down to be a warmer weather quilt, but warmed up by turning on my stomach and pressing myself flatly against the pad. Again, I could noticeably feel the warmth radiating back to me from the pad. The second night was warmer, and I felt completely warm and comfortable sleeping on my side. Overall I am very pleased with the performance of the Hyper High Mtn. I've found it adequately cushioned enough to be comfortable sleeping in my preferred side position for most of a night without having to shift positions too often, and amply warm for all the temperatures I experienced, without being overly hot. I was very impressed that it did not seem to collect condensation in most circumstances, although I noticed a very small amount early in the test period in sub-freezing temperatures. Even then, the design of the die-cut upper layer kept the condensation away from my sleeping bag, and it dried quickly during the morning. The dents and gouges the pad developed early in the test don't seem to be any worse after additional months of testing, and the pad seems to be durable. I haven't needed to use the included patch kit, since the self inflating portion has remained like new without any tears or even abraded areas. I have found that items I pack can make temporary impressions on the pad, such as the small ring from my cook pot shown in the photo to the side, but these go away within a day. Due to its bulk, the pad is a little difficult to pack. I find I have to roll it up carefully and hold it tightly together to get it back inside it's mesh bag. When I packed it inside the outer edges of my pack, I have to push strongly to keep it against the pack walls, and it takes up most of the pack interior. I've had to be fairly careful with the way I pack my clothing and other items so that they will still fit inside the long narrow space left inside the pack. Still, this isn't unexpected, since all full length closed cell foam pads are bulky, and I've had to find a way to deal with the bulk when I've wanted the extra warmth at moderate weight and cost that these type of pads provide. As warmer weather approaches, I plan to use a less bulky pad than the Hyper High Mtn the next several months, but will undoubtedly go back to using this warm and comfortable pad in the late fall when I expect to experience temperatures that could fall below freezing. Thanks to Pacific Outdoor Equipment and BackpackGearTest for the opportunity to test the Hyper High Mtn sleeping pad.